i lied to the pretty girl with the bushy brows and the bad teeth about jericho rosales. i had told her, with the conviction of a delusional fan, that echo was a friend and that we’d gone to the same high school. echo is BIG in malaysia, and it was my way of starting a conversation with the pretty attendant at mesilau. we had arrived under cover of darkness and while it was drizzling steadily, and were waiting for our food to arrive. “although i doubt if he still knows me now, because he’s so famous,” i said, nodding. “i don’t believe you,” the girl whose name i now forget, even if she said it around 4 times. “do i look like a liar to you?” i asked, and she just grinned, showing her teeth. (she is desperately in need of a good dentist). “well, i also have a filipino friend and he said that jericho is his model in his underwear,” she shared in an english that left much to be desired. “oh are you referring to malvin?” i asked, and her eyes rounded in disbelief, her bushy brows flaming in surprise. she must’ve blushed, if the yellow cast of the varnished wooden walls and ceilings allowed me to see it. she was shocked that i knew malvin, and even more shocked when i told her that yes, malvin, despite his proclivity for untruths, was actually not lying about jericho modeling for walker briefs. “i’m so embarrassed,” the girl said, covering her mouth. i was unsure if she covered her teeth, or this was a universal expression of diffidence. “yes it’s true,” i explained, winked at everyone else, and had a picture taken with her. finally, our food had arrived. before reaching mesilau nature resort, we had to travel by land for over 2 hours from the city center. we arrived in kota kinabalu in the state of sabah while it was raining. it wasn’t promising at all. 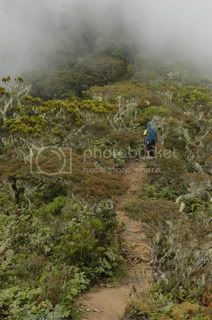 the whole of sabah was covered in a somnolent fluffy gray blanket, which didn’t quite augur well for our climb. the previous day, before i left, i was peppered with doomsday scenarios. on tuesday, just after my conference call, i turned on the “out of office” function on my MS outlook at around 9pm, and instead of heading home, i proceeded to marina in glorietta 4. earlier, i invited kuya mar for dinner. 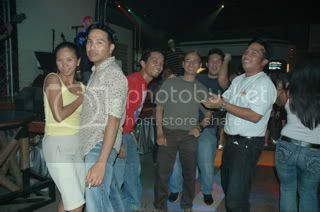 when i went back, sir oca, tito boy, and don had also arrived. after a while, roy was also in attendance. i asked for a few more pointers on what to expect in kinabalu, and how best to prepare for the trip. it was a little too late in the day for it, but i listened nevertheless. roy was predicting really bad weather, and said i’d probably see nothing but 360 degrees of white. on the morning that i prepared to leave for kinabalu, it seemed promising enough, but our destination was still 2 hours away. we traveled to the clark international airport onboard niel’s dad’s E150 (a gas-guzzling giant van). we boarded a plane which had seen better days. these budget flights scrimp on everything. no food is available for free, and the cabin crew spoke a funny, singsongy english. i slept for almost the entire trip, my tank nearly full on 2 jollibee hotdogs. in kinabalu, i had to open my bag for a customs inspection, and discovering nothing could be confiscated, i was allowed exit. it was raining still, and my heart sunk. from the airport, we proceeded to wisma merdeka to have our money changed. at first blush, i was greatly impressed with the city’s layout. it looked modern enough, considering that KK is separated from the rest of peninsular malaysia, and impressively manicured. the streets were orderly, and other than the initial disorienting right-hand driving experience, i liked what i saw. we had some of our dollars changed at wisma merdeka, and from there, we decided to have a late lunch at a local seafood restaurant. our driver named douglas suggested a place out of our route called gayang seafood. the resto stood on stilts over a murky river surrounded by mangroves. the mud had overpowered the water, and underneath, the riverbed was a lot exposed. we picked out our food from the aquariums and vats near the entrance. we choose a big fish head and specified we wanted something with soup. at about RM15 each, the food was just about average, and it is not something i would recommend to anyone. after dinner, we drove the rest of the 90kms up the slopes of mt. kinabalu to the mesilau nature resort while the rain wasn’t letting up. the road that inclined at a steady angle was wide, and we were driving really fast, despite the many blind turns up ahead. even in the dark of the evening and the rain, i could still see the skulking silhouette of the mountain far away, with a giant white streak somewhere in the middle. it was a huge waterfall. we made a turn somewhere towards mesilau, and we arrived at around 7pm. i stepped out of the pickup, and was almost immediately arrested by the nipping cold in the nature resort. there was a large thermometer at the door, and it indicated that the temperature was at 11 degrees centigrade. we moved our things over to bishop’s head lodge -- a creepy-looking dormitory behind the restaurant, changed into warmer clothes, and walked back to the restaurant for dinner. i shared a neapolitan pasta with may. dindo and eugene shared a steamboat, which i interfered with, throwing in all the ingredients into the separated vats of tom yum and chicken soups. the rest of the crew had an assortment of dishes, which weren’t necessarily cheap, although niel was quick to remind us not to be tempted to convert each time, but to rather stay within budget. i liked mee goreng the best. at past 9pm, we walked back to bishop’s lodge. it was then that we realized that other than another couple whom we thought were overly dressed, we were the only ones checked in at mesilau. immediately i thought it might have been a bad time to climb kinabalu. maybe they were right -- that the climbing season had ended, and that we’d be rained out. these thoughts played in my mind. before turning in for the evening, we played a few games of pusoy dos accompanied by my iPod and my stash of absolut raspberi. everyone else were taking turns at the shower. for some reason, the heater wouldn’t work, and we poured icy cold water on our bodies. screams were abundant, but we weren’t disturbing anyone else. at one point, i entered our room, and i caught a glimpse of bojo, his back turned against me, inside his red shirt, facing the window. i opened the closet and looked for my shot glass. when i turned around, bojo was no longer there. it turned out he was in the toilet all along. earlier, neil had said that there was a presence in the lodge, and if ever, this would’ve been my first sighting since 20 years ago. we slept at close to midnight. it may have been the excitement or the cold, but i kept waking every hour till it was finally time to get up. i occupied the bunk above niel, and i worried that each time i moved, the old double deck creaked and moaned. by 7am, i had already packed, dressed for the trek, and was ready to have breakfast. the restaurant opened late, but we had good meals nevertheless. 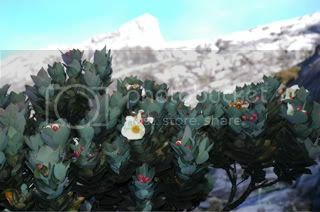 it was only at daybreak that i was truly able to appreciate the abundance of beauty in mesilau. i wouldn’t mind staying here an extra day. at 1800masl, it was a very impressive facility. the restaurant was built over a stream, which provides a steady, peaceful sound to the already idyllic surroundings. 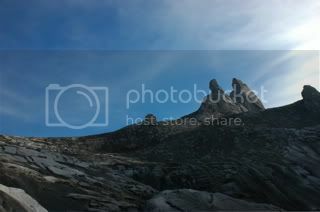 it is right smack in the middle of a forest, and the granite summit of kinabalu is visible in the distance. the restaurant exudes serenity, serves good food, and they fried my turkey spam for free. after some debate, i decided to pack kampung rice for lunch along the trail. we only got ready at way past 9am. they were already telling us that nighttime might fall on us if we didn’t hurry. after being given these nice IDs, we were finally ready to start trekking at quarter to 10am. the unassuming trailhead is just behind the kinabalu park office, fenced away by a grill gate. the minute i set foot on the muddy path, the trailhead unfolded before us in many twists and turns, tucked behind the trunks of great trees. after 15 minutes, i paused, chased my breath, and wondered how much more of this lay ahead. gerry had made several reminders very early on that it was 6.5km to laban rata, and that on average, there was one pondok at intervals of 1km. i walked on, steadfastly, till we reached the 1st pondok 35 minutes later. the view was great, and the sun was shining brightly up above, peeking from the spaces left by the lush leaves of the trees. 5.5kms more, i thought. we’d make it in good time. 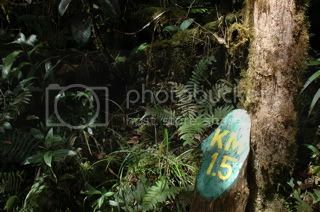 numbers painted and carved into tree trunks marked the distance every half a kilometer, so we were regularly apprised of our progress. but when jenny arrived, she announced that we’d been fooling ourselves all along. the 6.5km distance is measured from the timpohon gate, and that our choice of trail -- coming from mesilau -- is more than 2kms longer. ha! so why were we there? true enough, shelters or pondoks were stationed at an average of 1km. each one was paired with a tandas, and a tank of rainwater, with the warning that it was not treated. the trail leading to the junction was relatively difficult, ascending and descending like a wild crescendo. the environs are very tropical, and in parts will remind you of other local trails, such as the ones found in mount apo (from venado) and pulag (up the campsite). except -- and that is a word that ought to be highlighted -- that at steep inclines, the trail is paved with wooden stairs. the path is so well-maintained, it is not a surprise that this mountain is often described as ideal for beginners. whereas in my experience in “wilder” philippine mountains, we’ve often had to claw and crawl ourselves up muddy inclines. flitches of wood are also driven deep into the ground to simulate soil staircases, although there are parts where the steps are nearly as high as my hips. reminds me of the trail up to amuyao. 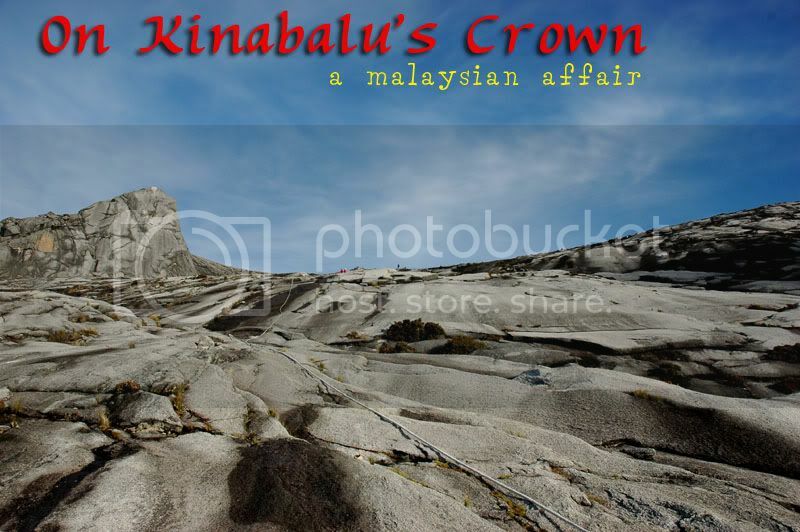 the kinabalu park is so huge, it covers a chunk of mountain plus its slopes. and this is a celebration of biodiversity. it would be a loss if one were to focus solely on the trail, since the canopy above explodes with life. there are abundant fauna, particularly these squirrels with rat-like snouts and hairy platypus-like tails, and birds or various colors. the great, erect trees are wrapped by orchids with floating roots and long, dark-green leaves, like bent swords. at a certain point, we breached the mossy forest, where trees are reduced to gnarled, stunted bushes, graced by threads and spindles and tangles of moss that seemed to glow in the dark. 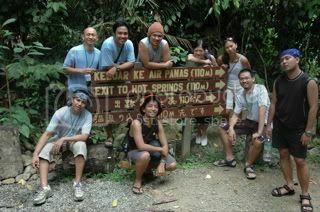 after a while, we reached the junction of the mesilau and timpohon trails. by this time, i had been pulled out of the lead, and thrown to the back of the pack. i was beginning to suffer some muscle cramps on my quads, and i had no salt to treat it with. at first, i tried to ignore the reverberating pain. i thought, since i had packed a smaller bag, i wouldn’t suffer my regular dose of cramps. but the only thing i took out was a pair of jeans and 3 t-shirts. it was still a very heavy bag with the spare SLR, speakers, vodka, and 2 liters of water. 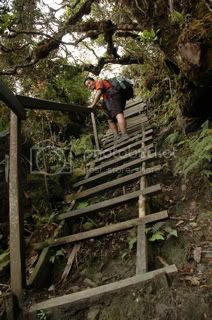 on the way up laban rata from the junction, still a good 2.5kms away, i met this swiss guy rushing up the trail. he said he just wanted to reach the dorm, and then go back down. what a weird idea, i thought, but around an hour later, i saw this same guy, complaining about his american-made TNF bag for failing, and saying that he’s going back down because none of the guides would want to summit at 7am. i corrected him about the bag, and said it was probably made in bangladesh or vietnam. the pain wasn’t letting up. i would pause after every 10 difficult steps, and reassess the situation. i had smothered salonpas on my legs, but this helped little. i was in a lot of pain, but was still in very high spirits. as i struggled to go up, i heard someone clicking his tongue against his teeth, as you would call a dog. i thought it was eugene (papachoo), so i made all of these dog sounds, barking, crying, breathing heavily. to my surprise, when i saw the guy, it was a complete stranger: a malaysian guy trying to call out some ugly squirrels. from the junction, the trail is a pure ascent, fenced on one side by the huge wires and pipes that bring electricity and water to laban rata, and even further up to sayat-sayat. eventually, i was last in the pack, when at the last 250 meters, the guide, haji, decided to carry jenny’s pack for her. laban rata was already within sight, and bojo was waiting for us, but i could do no more than just look. it’s the cliché once again that it must have been the longest 50 meters of my life. in front of laban rata was a sepak takraw court, and there were some malaysians playing the game. at more than 3,200masl too! when i entered the laban rata restaurant, i totally forgot about my cramps. there were a lot of golden heads around, and i was almost surprised to see that many people around. food was on the table, and i wolfed down someone’s mee goreng. i was just so hungry. almost immediately i started talking to people, taking pictures, and enjoying the great view! and it was only a little past 5pm. there was cable television and hot water! and i still couldn’t accept the fact that i was higher than mt. apo. i was beginning to enjoy everything when we were told to move our asses over to gunting lagadan. it’s 10 minutes away, niel said, and i followed suit. who the hell booked us here, i said, 2 minutes into the trek. when your legs are already so spent from ascending more than 1,400m, and traveling over 8.5kms of surface distance, even 50 meters can be hell. so i suffered the next 8 minutes in silent protest. gunting is RM10 cheaper than laban rata, but i would have gladly forked over an additional RM20 to be spared that punishment. at the time, that is. i must’ve been too tired or already starting to suffer from AMS because i insisted that the room had only 4 beds. i kept saying this, although there were clearly 8 bunks. since there were 9 of us, one had to sleep in the other room. i volunteered, so long as someone else was there. so niel and i were roomed in at the other room. then we got ready for dinner. jenny skipped this altogether because she already threw up earlier. 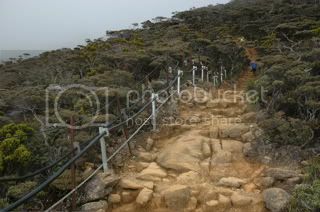 going down to laban rata from gunting wasn’t difficult at all. the minute niel and i got there, we immediately hopped to the buffet table. veggies, present. meat, check. we met the other couple that started from mesilau. the malaysian girl was in such pain, she was close to tears. “never again from mesilau,” she said, and we laughed. i went and got a plate, and asked how much the buffet was. there was something wrong with my hearing, because i misheard what they said and even said, “why so cheap?” at RM30, i could’ve had a fantastic meal somewhere in manila. 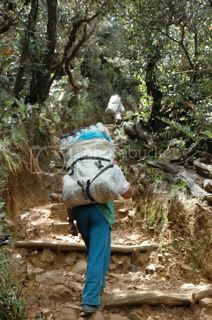 but i was up at 3,200masl, and all these things were carried by porters on their backs. i don’t think any of the supplies are flown in. so i guess the prices were “reasonable” enough. i can’t quite remember what was served for dinner, except that i had a lot to eat. there were these strips of meat that swam in some black sauce, which i only later learned was beef in pepper sauce. we ate a lot, and niel seemed happy with his vegetables. he was about to buy me a beer, but balked at the RM18 tag. surprisingly, coke was cheap, at RM4.80. 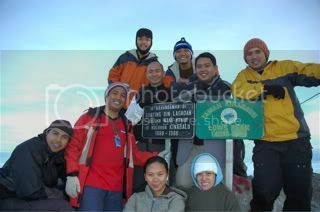 after dinner, we trekked back to gunting lagadan. it was less difficult now, since i had recovered from my muscle cramps, and i prayed it wouldn’t bother me for tomorrow’s assault. we had little to do at gunting, except to play cards. we attempted to teach mike, the iranian guy from mesilau, how pusoy dos was played, and even gave him a shot of absolut vodka. at 7pm, there were these japs complaining about our “noise”. i wanted to say, we’re not noisy, and it’s not even 9pm yet! we spent some time discussing what time we’d be getting up the following day, and then turned in for the night. i was a lot anxious. although i was very tired, i couldn’t get myself to sleep. i tossed and turned on my bed. it was very cold, but there were 2 thick blankets on my bunk, although i made sure i didn’t try to smell them. some of us had taken sleeping bags and bivy socks along. i kept waking all throughout that night because i would hear footsteps outside the room. lots of feet. running. gunting lagadan is spooky. at a few minutes to 2am, i told niel it was time to get up. i suited up, stretched, gathered for a group prayer, and started trekking at a quarter to 3. a huge group was already ahead of us, but one by one, we were overtaking each and everyone of them. before long, we were pacing the pack, and it was such a treat to look behind, since what followed us was a trail of lights piercing the biting cold of the early morning darkness. i started the trek inside my jacket, but after 15 minutes, i started to sweat and felt very uncomfortable in it, so i took it off. after the stairs, we reached the start of the summit plateau: the crown of granite that sits atop mt. kinabalu. the trail to the summit is marked by a white rope. there were some portions of the trail where you really had to pull yourself up on the rope. most times, however, we just walked, following the rope. then, at more than 3,600masl, we came upon a gate. it was the sayat-sayat hut. we were first to arrive there, and we thought about whether or not to regroup. i waited awhile for the others, and when we started walking again, i’d noticed that other than sleeping quarters, sayat-sayat also had 2 phone booths. we joked about it, saying it must be the last chance to call for a helicopter. at this point, the altitude was getting the best of me, and i was beginning to notice the thin air. flashes of garduce putting one leg ahead of the other at everest came to mind. i breathed heavily, and felt extremely spent with every exertion. one by one, these foreigners overtook us, and we made paltry excuses that we were waiting for our companions. one big inhale, one burst of exhale. it was tiring. but we walked on, feeling ourselves in the darkness, making out the shape of the mountain according to the patterns made by the dots of light ahead and behind us. then, a dark blue cast came over the mountain, as a hint of sunrise scarred the ominous-looking horizon. it was almost 5, and we’d been trekking for close to 2 hours. low’s peak was 25 meters up ahead, and we paused along the trail. under cover of pre-dawn, we sat silently, waiting. someone was leaving her mark near the trail. without talking, but silently agreeing, eugene and i picked ourselves up, and assaulted the last 25 meters. it was already very crowded up there where they’d placed a marker. instead of getting more space, we occupied an area just below the peak, with a good view of low’s gulley and the sunrise. 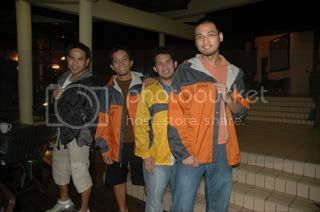 a streak of orange was starting to slice the darkness, and we put on jackets as we waited for the sun to rise. 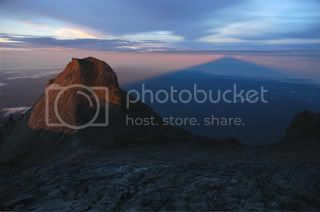 behind us, the long shadow of the mountain lay like a prostrate pyramid over the city of kota kinabalu. it eclipses the sunrise, and whispers to those who dwell in its shadow that morning hasn’t broken yet. we lingered awhile at the peak, waiting for the people to descend. when a portion of the peak had been freed, we lined up for our photo. a few clicks there, and we started to descend. 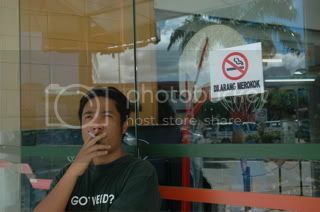 i was alternating between my nikon D70s while exposing film on my nikon F80s. i’d taken both of them up, and it was a good idea i did. the summit plateau rolls down like a gray mass of rock. on its own, the granite face looks almost unearthly, with several peaks jutting out in nearly every corner. cracks are scrawled by an unsteady hand all over, and running towards sayat-sayat, it feels as if the summit ends at a steep drop off: the much greener tops of humbler mountain ranges are visible in the distance. i took my sweet time photographing the surroundings, aiming my camera at donkey ears and ugly sister, trying to find a good spot without the flare, and stuff. below me, niel is sitting on the trail, eating something. later, he confessed that he slipped while running down, and hit his stomach on a slab of rock. i slowly trekked down to sayat-sayat, down to the stairs, passing these people who feared slipping, holding on to the rope as though the slope declined at steep angles, watching me as i walked. when i reached the start of the forest line, i saw laban rata down below. it was a clear day, and as i made my way down, i began to recall the bad predictions of those who had been to kinabalu before: that we’d be marred by bad weather, and that it would be pure luck if we are allowed a summit. sorry to disappoint the doomsayers and naysayers, but the weather was kind to us. shortly after i started my descent, we reached gunting lagadan, packed my bag, transported it to the restaurant at laban rata where the sign read: “take nothing but photografhs”, and ate a RM25 breakfast. i wolfed down a huge meal, and waited for 10.30am to start our descent. looking back at the summit from laban rata, it is almost difficult to imagine how it was possible for us to climb it. the summit plateau very suddenly plunges at a steep angle, its gray face dripping over like a nearly vertical curtain. our trail dissects the right corner of the mountain, where the granite meets the soil, then bends left towards south peak, and eventually goes up to low’s peak. “alman,” bojo warned. “english and skiing.” and we all laughed. later, while making small talk, niel asked one guy where he was from. “france,” the man said, and i said something in french. “how about you?” inquired niel, looking at the woman who walked with two bamboo sticks, each costing RM15. “manila,” she said. manila? i confirmed, and i had to hold back laughing out loud. “filipino ka?” niel asked. she nodded. well, i think i didn’t shout my comment at her anyway, so there. we continued with the descent, greeting each group we met, bidding them good luck with the weather as thunder was cracking high above. we overtook most of the groups that left ahead of us, much to their astonishment. at one point, niel was describing me as a mountain goat. down and down we went, rarely stopping, debating whether to wait for our companions. finally, just after 2pm, we reached the timpohon gate. i was so thrilled to see it that we walked past everyone who were resting, trying to find a restaurant. instead of finding one, we just saw a sign declaring the results of a climbathon. it turns out that the sutera sanctuary lodges are still a good 4.6kms away, and that we had to ride a van to get there. we went back to the gate, and waited instead for everyone to arrive. 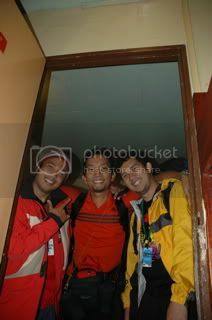 after a while, bojo, eugene, and dindo arrived. it was already almost 3, and we tried waiting for the rest of the pack. then it started to rain. real hard. we worried about them, and where they might be. one of the drivers delivers news from one of the porters saying that there were 2 girls still at layang-layang about an hour before, and they figured they’d reach timpohon by nightfall. we worried about our companions, but figured it would be best if we just proceed to sutera, and wait for them there. after all, we’d been in timpohon gate for at least an hour. these porters, by the way, were women. 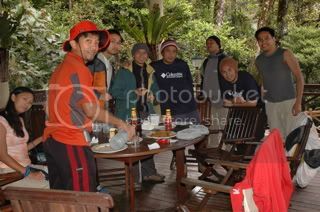 we met them on their way up to laban rata, and they arrived at timpohon shortly after we did. they very humbly said that they’d carried only about 30kg worth of goods. 30kilos! that would have killed me! on our way, we found out that the porter was referring to a different group. after all, our women weren’t injured. it was neil whom we worried about. so i showed pics on my dSLR. we were a bit relieved to discover they were ok. we proceeded to sutera and ordered a very late lunch. jenny, gerry, may, and neil arrived shortly after while we were eating very good food. after eating, we left immediately for poring hot springs. it was already starting get dark. in about an hour, we reached poring while it was raining very hard. 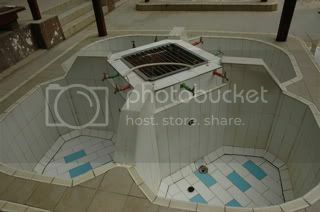 we ran to the hot springs despite the rain, and were very surprised to find instead a series of small tubs with faucets. we later learned that these were personalized hot springs, where you had to turn taps on and mix sulfuric spring water with ordinary tap to reach an ideal temperature. many of us soon gave up on the whole idea. bojo didn’t, so when his tub was full, i just jumped in to join him. we talked at length about many things, even while the dark sky cracked with thunder and lightning. after a while, we returned to our bunks, bathed, and went to the rainforest for dinner. the malaysians who had the hots for niel were also there. there were large beetles on the ceiling. i ordered tom yum soup, and specified that it be mild. i hardly finished half of it because it was about to inflame my lips. after dinner, we returned to our rooms, and finished the remaining vodka over games of pusoy dos and tong-its, none of which i lost. i slept soundly that evening, and very early in the morning, niel and a few others left to experience indoor hot springs. on the other hand, us sloths opted instead to have cheap breakfast outside the resort. although cheap, breakfast was rather good, actually, and we all had a lot to eat. for the rest of the morning, i dropped by the butterfly farm, and i was astounded to see as many as 4 kupu-kupus. it was apparently off-season. still, i paid RM2 for that. 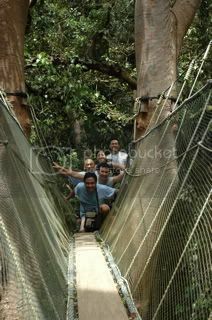 after checking out, we decided to visit the canopy walk. we were very shocked to discover that it was a considerable hike up ahead. it didn’t quite impress me, actually, since in 1997, when i first visited malaysia, i managed to walk through what was then touted to be the world’s longest canopy walk at taman negara. this bridge was only over 200m in length. it was a big disappointment. plus, dindo was starting to get sick. since we were there anyway, we decided to trek to the bat cave, which is supposed to be about 700m away. on the way we passed by kipungit waterfalls (which really should change its name to kipAngit -- majayjay is so much nicer than it). the bat cave was also a big let down since it was basically a deep crevice formed from big rocks that had fallen atop each other. and to top it all off, i suffered a leech bite! afterwards, we ate lunch at tropicana, also outside poring. at past 2pm, we started our way back to kota kinabalu. it was raining on and off, and we were all very tired. we just drove back to the city, eager to stretch our tired muscles, and perhaps experience some sabah-styled nightlife. we were dropped off at borneo backpackers. finding that there was no longer room, we tried to look for room elsewhere. while i was getting myself some shirts, we discovered that we’d been booked elsewhere. 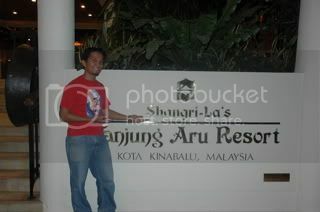 nothing too special, only at a 5-star hotel: shangri-la resort at tanjung aru. we were told it was walking distance, so we started, but then we discovered that the resort is around 6kms away. no one was interested in hiking through the city, so we occupied 3 separate taxis, each at RM15, and were deposited in swanky shangri-la. the doorman announced our arrival by banging on the gong. while i was there, the gang started to joke about our high-flying accommodations for the night, which just about met my expectations. of course, we were there because of neil, who is director of communications at edsa shangri-la, and that we really didn’t fork over USD210 for each of the rooms. suffice it to say that we all rode on his HUGE employee discount. i shared my room with gerry and niel, who slept on the roll-away bed. while the hotel staff was setting it up, we were asking for suggestions on where we could possibly go out. eventually, i slipped into a red astroboy shirt and we went to centrepoint for dinner, which happened at KFC. and then at a little past 9pm, we walked over to the waterfront, walked into BED, and looked around. there was another place: shenanigans, but that meant we had to take a cab going there, so we just stayed put. i ordered a pitcher of beer. and good gracious, it was really expensive beer! it wasn’t nearly as good as sanmig strong ice, but it was still a whopping RM53, not counting tax and service charge. nevertheless, i tried not to think too much about conversions at the time, and decided instead to own the dance floor when the filipino band played this song. i succeeded in getting may to dance the swing with me. when the band returned for their second set, we finally got to really dance. wildly. now malaysians aren’t the best dancers in the world, i have got to confess, so much that even bojo and eugene looked really good strutting their stuff there. then, at 12mn, like faithful cinderellas, we decided to leave the “best entertainment destination”, and try out a different place, hopefully with cheaper beer. but there was a slight drizzle, and the folks were still very tired, so we just decided to get back to the resort. i was the last to doze off to sleep as i tuned in to news about the earthquake that ravaged central java in indonesia. the following morning, we all got up early. too early in fact, that i didn’t even have time for a shower. they were inviting us for breakfast. i asked how much the breakfast was, and it was around RM55. i said i’ll decide when i see it. when we walked into café tattu, i was arrested by a colorful treat of shapes and scents. i held back a drool while i opened tray after tray of wonderful delights. i debated no longer whether i would have breakfast despite the prohibitive bill, and took liberties in photographing each one of them. the breakfast buffet was by no means a small feast, and i couldn’t decide on what to sample first. i began imagining the flavors in my mind, and it made me even more excited. but the weirdest thing happened. the moment i brought the first spoonful to my mouth, i had to force myself to chew. and it was even more difficult to swallow. quite oddly, i couldn’t taste anything. i swear there was nothing wrong with the food, but that there was something wrong with me. i suddenly lost my appetite, and wasn’t even close to hungry. i had no desire to eat, and my biggest regret really, was that it was a very expensive breakfast, and that there were just too many things to choose from. it was an opportunity lost, so to speak. niel was the only one who ate as much as he paid. i couldn’t even finish the only plate i took with me to the table. after breakfast, we proceeded to the beach and the pool. there were blue seats facing the sea, paired with green umbrellas. the beach was awful, actually, but the pool was better. we did laps and a few other things. at 10am, we returned to our rooms. they still had plans to do some shopping. the rest of us just opted to stay put, enjoy the USD210 accommodations, and wait for check-out. by the time they returned, i had already packed. niel, as planned, was armed with a new acer laptop, which he got at just over RM3,000, still more than PhP15,000 in savings, which pretty much covered his KK trip. i just told him: good luck with customs. while they hurried to check out, bojo and i hurried to get the 12nn shuttle to the city proper. because we had delayed on getting tickets, returning to the philippines on that sunday meant we had to spend an extra PhP4,000 plus. so we opted to depart the following day and have a “brokeback monday”. we didn’t know where to stay, and just decided to get off at wisma merdeka, and check in at the first backpacker inn we’d find. so we ended up at north borneo lodge, which had aircon rooms at RM23 each a night, free unlimited internet, and breakfast. after depositing our things, bojo and i decided to “explore” the city. we proceeded to have some pesos changed into ringgit. i ended up getting a deuter quantum 37 for less than RM300. for some reason, i had an urge to spend all my ringgits. when gerry instructed all of us to bring USD300 each, i was more or less prepared to spend USD300, so i just sort of decided to bleed a few more ringgits and got a few other things that people back home might expect. bojo and i sort of walked from wisma merdeka to kk plaza where we had lunch, then to centrepoint, then back to wisma merdeka, then back to centrepoint. we had planned on killing time by watching a movie. you’re in a foreign country -- why see a movie? 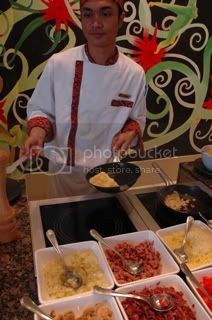 well, since we didn’t feel that there was anything compelling within kota kinabalu that merited a visit. 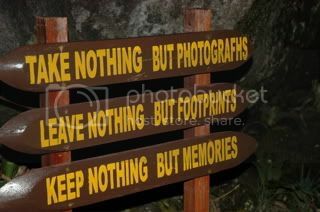 not after mt, kinabalu, that is. so yes, we searched for the cinema on centrepoint’s 8th floor. searched is the word. the difficulty of communicating got in the way and we had almost gotten lost just trying to find the way. at that precise moment, i really really wanted to go back home where the mall culture was so much more sophisticated. and this wasn’t helped by my actual experience inside the cinema. the tickets were at RM7 each, which is around PhP100, but i felt it wasn’t really worth it. the cinema was rundown, and the sound was just awful. we chose x-men 3: the last stand, and there were very distracting subtitles that flashed briefly, i wondered whether people got to read them. i kept ranting about the mall and the cinema until i walked out of centrepoint and then i slowly realized that KK isn’t KL, and it isn’t even peninsular malaysia. despite the pleasant, resort-like atmosphere that is exuded by the entire city, this can hardly compare to the more cosmopolitan cities of metro manila with their modern theaters and giant malls. so enough of that. for the last time, bojo and i walked back to wisma merdeka because he was interested in buying this malong for someone. he ended up with a stuffed toy since the malong was damn expensive. then we had dinner at kenny roger’s. expensive dinner, and our orders were taken from the table. now there’s something different. we walked back to our lodge and planned to go out for some beer after 9pm. since it was still around 8pm, i decided to rest a little. i dozed off, and the next thing i knew, it was nearly 2am. i looked at bojo and he was covered under his sheets. oh well, first time in a foreign city and we spent it inside malls, a moviehouse, and sleeping! haha. the following day, we had breakfast at the lodge. it wasn’t filling at all, but it was free anyway. we bought shirts at the filipino market where a talkative lady from tacloban correctly guessed we were kababayans. after getting the shirts, we had lunch at this chinese restaurant that served pork. we had a choice of 3 viands for RM4. not bad, actually. a RM20 taxi ride then took us the airport. now, a short note on KK taxi drivers: they’re the worst! i have now better respect for filipino taxi drivers. not once in KK was the meter turned on. each trip was pre-arranged at killer prices! goodness. and these are the worst taxis ever! crappy cars with crappy airconditioning! after having our bags checked in (i almost exceeded the 15kg limit), we boarded the plane. bojo had the unfortunate fate of sitting beside the noisiest group of pinoys ever. i just slept through most of the trip. there was a separate group onboard, and they had apparently climbed mt. 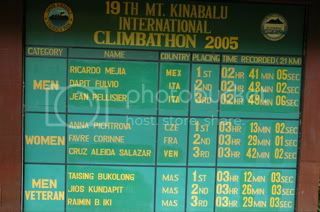 kinabalu as well since they had these rather pretentious IDs proclaiming they were part of a mt. 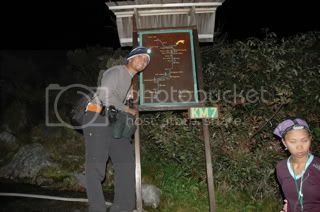 kinabalu expedition (a word which is defined as a journey undertaken for a specific purpose, usually exploration and/or research). romi garduce’s influence is all over, i swear. oh, the french guy and the "skiing" girl were also on the flight. 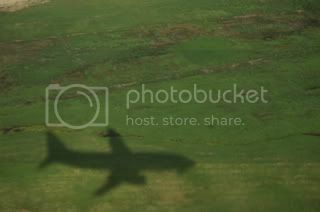 the flight was uneventful, and we arrived in good time, and had no trouble at customs. i got another bottle of absolut vanilia -- i’ll have good use of that soon, and took a bus to SM megamall. so here ends my kinabalu experience. it is something i wouldn’t mind repeating in the near future. 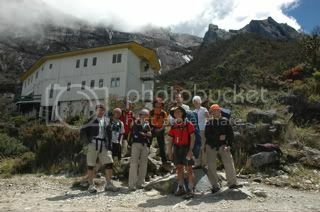 i would like to return to kinabalu armed with this experience. what i’ve learned on this first trip would help me make better decisions if the opportunity arises again. and i couldn’t help but give in to the temptation of asking the question: why can’t we do this in the philippines? why can’t there be lodges with heated water midway to mount apo. why can’t they turn the ranger station in mount pulag into a real dormitory with a restaurant? i entertained ideas of turning these mountaineering destinations into eco-tourism spots, with their paved and maintained trails and pondoks and tandas every kilometer or so. and then, this counting crows song played in my mind. well, there is a reason for everything. at syempre enjoy sya na bida sya. kung alam mo lang. ang tanong nya nga sa akin: bakit hindi ko daw na-kwento yung nangyari sa kanilang 2. ang sagot ko: hearsay naman yun in so far as i'm concerned, kasi wala naman ako dun. malay ko ba kung talagang binigyan ka ng singsing na cheap at nahalikan mo sa lips? haha. malvin and tall tales. synonymous. oy ganda ng kinabalu noh! wahaaaaaw that sounds like so much fun.